At Issue In Florida Senate Campaign: Who's Fighting For Puerto Rico? Florida Gov. Rick Scott joined a January event on the ongoing relief efforts for those affected by Hurricane Maria in Florida and Puerto Rico. With a growing bloc of voters from the island in Florida, the Republican Scott and Democratic Sen. Bill Nelson have been attacking each other over the issue of relief efforts in Puerto Rico in their high-stakes Senate campaign. Florida Gov. Rick Scott has visited Puerto Rico six times since the island was ravaged by Hurricane Maria last year. He's brought aid, advice, and on one trip, even a delegation of utility providers to consult on how best to restore the island's tattered power grid. On his most recent trip, a reporter asked Scott what he would have done differently from the federal government in its maligned response to Hurricane Maria. "I don't know what I'd do differently," Scott said, adding that in his experience managing hurricane responses as Florida governor public communication is most important. Florida Democratic Sen. Bill Nelson pounced. On Twitter, he said in part, "Rick Scott does not understand that people are hurting and in need." Scott, a Republican, is Nelson's main challenger as he seeks reelection this fall. It's one of the most closely watched Senate races of 2018, with a vulnerable Democrat running in a state won by President Trump in 2016, and the federal response to Hurricane Maria has become a major issue. That's largely because tens of thousands of Puerto Ricans have relocated to Florida since the storm, and many more already live there. Since they are American citizens, Puerto Ricans are allowed to vote in Florida after they move there. Unlike when they lived on the island, the new arrivals from Puerto Rico now have full representation in Congress. Like Scott, Nelson has been a regular visitor to the island, including a trip in May in which he visited a community where he said nearly a third of the people still didn't have electricity. At a news conference with Puerto Rico Gov. Ricardo Rosselló, Nelson said, "This is unacceptable. It's eight months. Ocho meses despues del hurricane. We will continue to fight to try to see that Puerto Rico is treated like Puerto Rico should be." Scott's campaign struck back at Nelson last week with an online video ad, showing Scott in Puerto Rico, also with Rosselló. "Senator Bill Nelson is playing politics on Puerto Rico," the ad says. "Nelson has no problem exploiting the suffering of others for his own political gain. Now Nelson is attacking the one public official who's actually helped the people of Puerto Rico, Governor Rick Scott." That same day, Scott's office sent out a press release announcing that Florida is sending 25 used police cars to the island, leading to charges from Democrats that he was the one playing politics with Puerto Rico. Democratic political strategist Steve Schale says there's a very good reason why Scott and Nelson are scrapping for the Puerto Rican vote: "Puerto Ricans now are probably the largest Hispanic voting bloc in the state, and Orlando is now the second-largest media market [in Florida]." Well over a million people of Puerto Rican descent are now estimated to live in Florida, nearly as many as the state's 1.2 million Cuban-Americans. Since Hurricane Maria, the Puerto Rican population has grown greatly, especially in the Orlando area. Because they're U.S. citizens, Puerto Ricans can register to vote as soon as they arrive in Florida, boosting their presence at the polls. To maximize turnout, the Democratic National committee recently announced a $100,000 grant to the state party to boost its outreach to Florida's Puerto Rican voters. Although Puerto Rican voters have mostly supported Democratic candidates, in past elections, such as the 2016 Presidential race, their vote has been offset by another population that's growing in central Florida. Those are retirees from the Northeast and Midwest, a group of reliable Republican voters. Bob Cortes, a Republican and Puerto Rican who serves in the Florida state legislature, says newcomers from the island aren't automatic Democratic votes. Politics and the parties they're familiar with in Puerto Rico are completely different than those on the U.S. mainland. Cortes said, "These are voters that do not understand what the ideologies of the parties mean. They are not familiar. Therefore, most of them that have been coming, they actually have been registering NPA," or no party affiliation. What's not clear is how many new arrivals from Puerto Rico have resettled permanently in Florida. Early estimates of 200,000 or more by the Governor's office now seem high. More recent estimates now put the range somewhere between 50,000 and 150,000. Jared Nordlund is with Unidos US, a non-partisan group that has registered more than 12-thousand new Puerto Rican voters in Florida in just two and a half months. He says many of the newcomers are getting engaged politically, and there is one overriding issue: what happened after Hurricane Maria. Nordlund says, "They are fully aware of the response of the federal government and what it lacked. And I think there's some anger in the community around that." 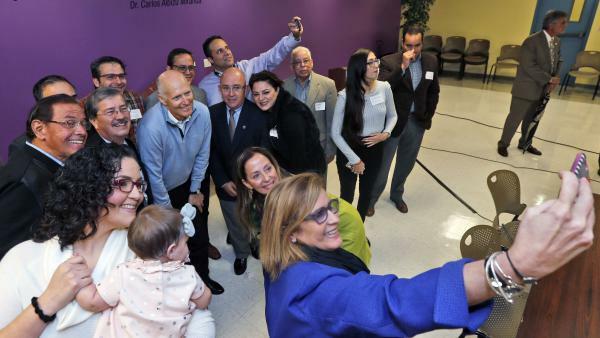 Bill Nelson recently held a news conference where he received the endorsement of former Puerto Rican Governor Pedro Rosselló, the father of the current governor. Rick Scott has been endorsed by Puerto Rico's delegate in Congress, Jenniffer González. Scott also has the support of President Trump, a longtime friend. And in the contest for the Puerto Rican vote, Democratic strategist Steve Schale says that may be Scott's biggest challenge. "For Puerto Rican voters who are angry about Maria, who want to send a message to Trump, the likelihood of them doing it through voting for Rick Scott is very low," Schale said.